Description of "Holistic Healing in Tropical Diseases"
This is the first book of its kind with emphasis on Health Care is Self Care. Comprehensive Holistic Healing Treatment for 15 Tropical Diseases - Anthrax, Cholera, Dengue, Dysentery, Elephantiasis, Heat Stroke, Hepatitis, Intestinal Worms, Kala-azar, Leprosy, Malaria, Rabies, Tuberculosis, Typhoid and Yellow Fever - has been given in detail. A must read for travelers. 2nd Edition published by popular demand. Dr. Leo Rebello, N.D, Ph.D, D.Sc, D.H.S, F.F.Hom, M.B.A, D.Litt and LL.D. (honoris causa), has 35 years of clinical, teaching and research experience. He has trained and treated over a million people in 65 countries, written 45 books and been interviewed by the world media. 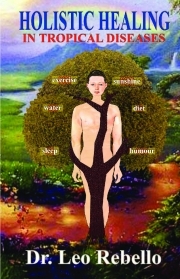 Director of Natural Health Centre; Fellow of Indian Nature Cure Practitioners Association; Fellow of European Medical Association; Fellow of European Medical Association; Permanent Fellow and Advisor to British Guild of Drugless Practitioners and World Peace Envoy are some of the offices held by him. This 'Patriot of Humanity' takes keen interest in Holistic Development of the World, World Peace, Nuclear Disarmament, Education, World Parliament, Human Rights and Philanthropy. Reviews of "Holistic Healing in Tropical Diseases"